The day to day activities that most people take for granted can be monumental struggles to those with disabilities. Having more than one disability, and invisible ones at that, makes life even more difficult. I was diagnosed with bilateral sensorineural hearing loss at age 3, and suspected of having autism from the age of 6. My journey has not been an easy one, but I now have the supports around me to live independently. Before I was old enough to get PWD assistance when I turned 19, my parents had to pay for all of my hearing aids, batteries and tests out of pocket. I did go through mainstream public school, though I had an Educational Assistant to support me as well as using an FM system worn by the teacher. The as yet undiagnosed autism became more apparent as I grew older, though my mother had to fight very hard to have me tested at Queen Alexandra Children’s Hospital when I was 12. My hearing continued to drop over the years, until I received a cochlear implant on my right side at 17 when I was no longer able to wear hearing aids. At 18, my psychiatrist officially diagnosed me with autism, which enabled me to be accepted for PWD at age 19. I really started to come into my adult self once I began receiving Ministry Assistance. Never having even attempted to obtain a driver’s license, the Bus Pass gave me the confidence and the freedom to explore the city and run errands by myself. As well, the Ministry pays for all equipment and maintenance towards my cochlear implant and the hearing aid I now wear as well. I was also approved for Community Living British Columbia (CLBC) assistance when I was 22, and received a support worker who comes several times a week to help me with chores, meal planning, shopping, and similar activities. Finally, I spent two years in an assisted apartment building to help me build independence after moving out of my parents’ house. 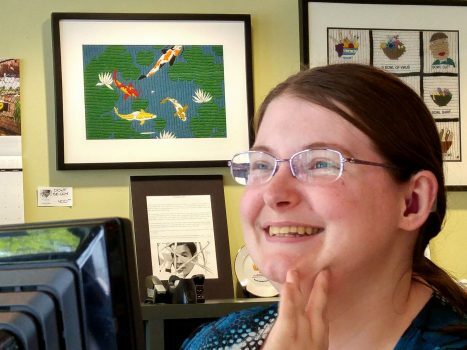 Present-day, age 24, I live in a one bedroom subsidized apartment, I volunteer twice a week with the Victoria Disability Resource Center, and I am able to live independently with the help of my support workers. I have lots of creative talents and hobbies, such as sewing, painting, poetry, as well as a love of music. I have played the piano since age 3, all through losing my hearing, and am now at a Grade 9 (out of 10) level. I took Choir all through high school and still love singing, and have recently discovered a passion for dancing. Many things are still difficult for me though. I have social anxiety, which makes crowded or loud situations very stressful. Texture issues from the autism make certain chores and hygiene tasks a struggle, as soaps and lotions raise my anxiety. A short-term memory has led me to become very meticulous about writing things down. I think the most important thing about living with a disability is being able to acknowledge it to yourself. My hearing loss was impossible to ignore, of course, but I did not fully accept that I was autistic until two years ago. I have finally come to understand that there is nothing wrong with reaching out to the supports that are available to me when I need help. I have built an amazing group of friends around me, most of whom I met through my volunteering at the Victoria DRC. As well, I have a very supportive boyfriend. Most of the self-reflection I have done has been through my boyfriend’s guidance, and with his support I am actually beginning to rely less on my workers to supervise me with chores and am taking initiative to do certain things on my own. I am definitely coming closer every day to my full potential, but I still have a long way to go. My volunteering at DRC has shown me how much I enjoy administrative-type work, so I am searching for jobs in that field. I also would like to go back to school at some point, most likely to study math. After all, just because I have disabilities does not mean I won’t go far!